I didn’t see Frighteners again until I watched the “Director’s Cut” on laserdisc when it arrived in 1998. At that time, I found the movie to be much more satisfying. That’s partly because the extra 14 minutes or so found in the “Director’s Cut” flesh out the story, but I think it’s also because I knew better what to expect. When taken on its own terms, Frighteners can be reasonably satisfying. 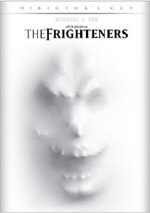 However, I don’t want to go nuts here and acclaim Frighteners as some neglected classic. In no way can I consider it anything great, or even especially good. The main issue stems from the fractured narrative and jagged storytelling. Particularly in the first half of the movie, it feels like something of a mess. While Jackson proved able to balance a mix of threads well in the Rings films, here he encounters troubles. All those lines battle for prominence and don’t mesh together terribly well. This leaves us somewhat confused about where the film plans to go and not sure what to care about and what to discard. And this was even worse in the theatrical edition – at least the “Director’s Cut” makes matters more coherent. I still think the first half meanders too much and feels unsure of itself. Jackson firms up matters much better in the second half. That occurs partly because he more clearly embraces the horror. The half-assed Ghostbusters bit goes out the window as the movie turns into a battle against an extremely powerful dark agent. The occasionally goofy moment still pops up, but Jackson appears more comfortable when he strictly goes after the scares and action. I’ve now seen Frighteners four times. In addition to the theatrical viewing, the old “Director’s Cut” LD and this new DVD with the longer version, I watched the original edition on a DTS LD back around 2001. Every time I check it out, I change my opinion of it. My feelings bounce up and down from mildly negative to moderately pleased to very positive. 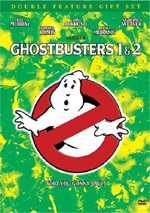 The Frighteners appears in an aspect ratio of approximately 2.35:1 on this double-sided, double-layered DVD; the image has been enhanced for 16X9 televisions. Despite many gorgeous moments, the transfer lacked enough consistency to earn a grade on the “A” level. For the most part, sharpness was excellent. A few wider shots betrayed minor softness, an issue influenced by some light edge enhancement. However, the majority of the flick looked very concise and well-defined. I discerned no issues with jagged edges or shimmering, but source flaws created distractions. I noticed occasional examples of specks and grit through the film. Though these never became heavy, they still appeared more frequently than I’d like. I can’t say I anticipated a bright palette from a ghost story, but Frighteners managed to present a surprisingly broad color template. And it did so well, as the hues always looked dynamic and lively. Blacks came across as dark and tight, while shadows were smooth and concise. Consider this one to be a very strong “B+” image. Although the Dolby Digital 5.1 mix of The Frighteners boasted quite a few standout moments, some auditory issues caused problems. Actually, my only true complaint related to bass response, but that area was such a distraction that it sometimes negated the positives. Low-end usage tended to be awfully loud, and it overwhelmed the rest of the material. Frighteners presented a fairly active soundfield. While it didn’t go nuts, the many ghost-related moments gave it room to expand. Those elements zipped and zoomed around the room to create a good sense of the settings. The mix remained more subdued during moments without spirits, but since so many of those occurred, the track came to life quite frequently. Add to that good stereo imaging for the music and this was a satisfying soundfield. The mix as a whole would have been a “B+” or an “A-“ with tighter bass, but the loose low-end left it with a “B”. 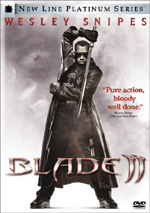 An adaptation of the 1998 laserdisc, this DVD mostly replicates materials from that set. It spreads these across its two sides. For something new, we find an introduction from director Peter Jackson. In this two-minute and 39-second clip, Jackson talks about the film’s influence on Lord of the Rings, its connection to the rest of his career, and changes made for the Director’s Cut. Jackson provides a nice little intro for the film. As I noted, this commentary repeats from the 1998 laserdisc. This fact may irritate some who want a new commentary, but I have no complaints about it. For one, it enjoys historical value since it was Jackson’s first-ever commentary and it presents a point of view he could no longer offer. It’s interesting to hear Jackson between films and before he became rich and powerful. In addition, there’s no need to reinvent the wheel. Jackson covered the film well in 1998 – why try to re-do that? Moving to Side Two, the sole attraction comes from The Making of The Frighteners. That may not sound like much, but since this documentary runs three hours, 43 minutes and 38 seconds, I can’t imagine too many folks will complain. Matters open with a new 111-second intro from Jackson, as he lets us know about the LD history of the piece. From there the documentary uses the standard format, as we get movie snippets, behind the scenes footage, and interviews. We hear from Jackson, executive producer Robert Zemeckis, creature effects designer Richard Taylor, Weta systems administrator Jon Labrie, CG supervisor Matt Aitken, CG supervisor John Sheils, visual effects supervisor Wes Takahashi, CG supervisors Wayne Stables and Gray Horsfield, character animators Christian Rivers and Kyle Balda, composer Danny Elfman, technical director Stephen Regelous, digital effects producer Charlie McClellan, and actors Jim Fyfe, Trini Alvarado, Michael J. Fox, Chi McBride, John Astin, Jake Busey, Jeffrey Combs, and Dee Wallace Stone. Back in its day, LD fans regarded this as a groundbreaking documentary. Now that we’re in this day, it still looks pretty amazing. It certainly qualifies as one of the longest documentaries made to supplement a movie; indeed, it may remain the longest of them all. But size isn’t everything, so it becomes important that “Making” delivers the goods. That it does. We get a terrific feel for the production and receive a great deal of information about all the appropriate areas. We also see many fine shots from the set, elements that come to the spotlight during one 26-minute montage of those pieces. Even the bloopers are pretty good, such as when Fox forgets he’s not making another Back to the Future movie. Combined with the storyboards on Side One, this becomes an exhaustive but still very entertaining and engaging piece. I’m happy that Peter Jackson’s success finally prompted Universal to release the extended cut of The Frighteners on DVD. It’s an erratic flick but a generally entertaining one. While it doesn’t compare to Jackson’s better-known efforts, it has more than enough good moments to make it enjoyable. The DVD offers reasonably good picture and audio along with an excellent set of extras. A very solid DVD for an interesting movie, I definitely recommend this release.